"This is my favorite indulgence. And an indulgence it is! Very rich and will most definitely satisfy any sweet tooth! Pull cheesecakes out of freezer 30 minutes before serving." Line 10 muffin cups with paper liners. Stir cookie crumbs and butter together in a bowl; press into the prepared muffin cups. Refrigerate chocolate crusts until chilled, about 15 minutes. Beat peanut butter, cream cheese, and confectioners' sugar together in a bowl until smooth. Spoon peanut mixture over the chocolate crusts; refrigerate until chilled, about 30 minutes. Pour cream into a microwave-safe bowl and heat in microwave until just before boiling, about 2 minutes. Stir chocolate into cream to melt. Refrigerate ganache until completely chilled, about 1 hour. Beat ganache using an electric mixer until whipped; spread evenly over peanut butter mixture layer. Freeze cheesecakes until solid, about 1 hour. You can customize the ganache. For example, once I used a hazelnut cream liqueur and extra peanut butter chips. Substitute Baileys® Irish cream for the cream if desired. For sweeter ganache add some icing sugar to your taste! I also used some milk chocolate and some peanut butter chips. It can be sweeter or more bitter, depending on the chocolate you use and the amount of confectioners' sugar you add in. My mother loves cheesecake, so I gave her this recipie also, we both loved it! Thanks!!! My favourite combo! I make these whenever I want to totally indulge. 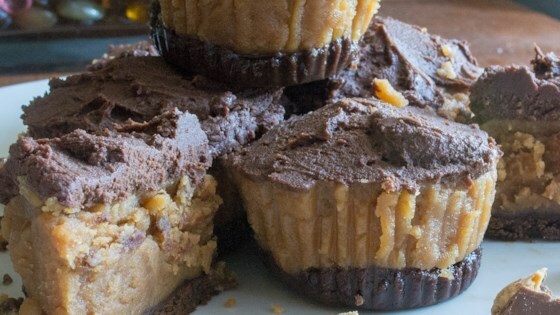 For added indulgence I add mini peanut butter cups on top, and sometimes even a bit of chocolate drizzle! Yum, Yum. My daughter made me and hubby some of these. They tasted great! She is my favourite little chef. I will use a little less peanut butter next time as the cream cheese taste got lost. But very tasty! I used plain Graham Cracker Crumbs.